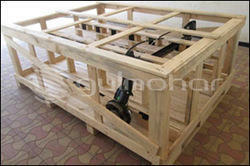 Manufacturer of a wide range of products which include wooden pallets. Wooden packing offered by us is fabricated using quality wood that can with stand harsh weather conditions. The boxes are durable, Reliable, Tension retaining, Shock absorbing and dimensionally accurate and ensure safe carriage for variety of materials.